At the Machines step of the wizard, select one or more machines that you want to recover. From infrastructure — browse the virtual environment and select machines or machine containers to restore. 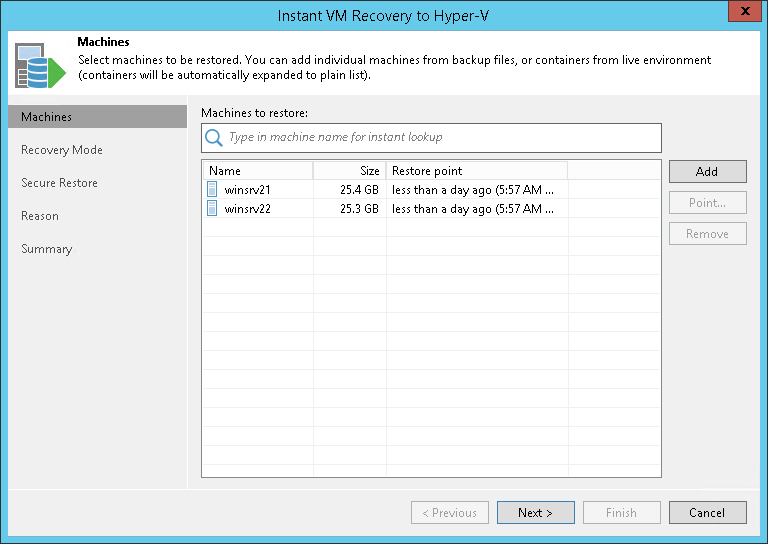 If you choose a machine container, Veeam Backup & Replication will expand it to a plain machine list. When you add a machine to the list, Veeam Backup & Replication displays information about the most recent restore point in the Restore point column. If no restore point is available for the added machine, Veeam Backup & Replication will display a warning next to this machine. From backup — browse existing backups and select machines under backup jobs. To quickly find machines, you can use the search field at the top of the wizard. Enter a machine name or a part of it in the search field. Veeam Backup & Replication will display possible matches. If the machine is not in the list, click the Show more link to browse the virtual infrastructure.